The road to Ali has been long, high, difficult, cold and full of compromise. The day of reckoning came on October 11th when we crossed the 5190 meter Khitai Pass. The ibuprofen I had taken in the morning to reduce the shoulder-neck pain that I'd been having had worn off, and I was greeted at the top by a wicked headache. The lowest point we could reach that day- and for the next 10 days- was 4830. We past an icy, sleepless night in a sort of foxhole campsite. The temperature was in the single digits (Farenheit) and my years old REI down bag was rated just to +20. I resolved to end it there. Not my life, but my riding. Ahead of us were four more passes each over 5000 meters. Probably we would have been safe, but I was unwilling to face the lack of oxygen and the lack of thermal units. We rode and camped one more day, as the elevation increased very little there, and we had a long and difficult discussion as to what to do. 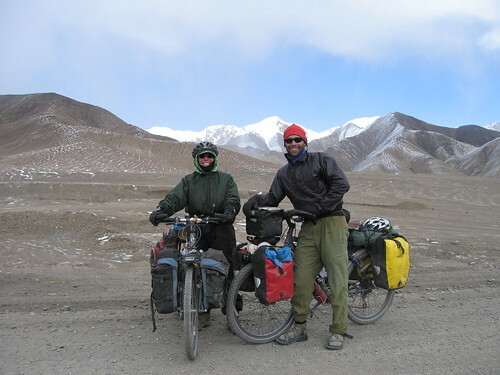 It was unfair to rob Chris of the chance to cycle over the highest passes in western Tibet. I was prepared to hitch 260 kilometers to the town of Domar at 4380, and wait for him to join me. We slept one more night, our tent erected inside a deserted Mao era building, serenaded by Tibetan Mastif Ducks. By morning, Chris had resolved to keep the team together, and we began a 3-day hitch that carried us 450 kilometers over the four high passes, and to this well-supplied, Tibetan town of Ali. Our rides were with Muslim Uighurs, Hui Muslim Chinese, and Han Chinese. 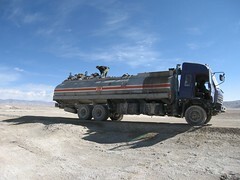 We rode in a fuel truck, a coal truck, and a road construction electrician's truck. We slept at night in simple dormitories, and ate our fill after dark, as our Muslim benefactors were observing Ramadan, and we were reluctant to eat in front of them. It was painful to enter Tibet in a vehicle, although it would have hurt worse to ride through the snow and sleep so cold and high. It was especially crushing on the second day, when our truck drove us around the shores of the beautiful Pangong Tso Lake, bordering India. The day was pleasant, the water was turquoise, the road was inviting and we were in a vehicle. But it was a pleasure to be protected in the work truck with the electrician when we passed through 60 kilometers of hellacious wind and sandstorms in the long stretch of eroded road construction. Our driver, the electrician, stopped to do some work, and during our 3 hours of waiting, we helped erect an insulated canvas tent, and looked around at the rock crushing equipment. But mostly we snacked and read, well protected in the thin metal hull of the truck. Now we are filling our last hours of civilization with internet, errands and shopping. Tomorrow we head out with a Danish guy as we join forces on the way to Mount Kailash, nearly 300 kms distant. Beyond that it's another 500 to Saga at the intersection of the Friendship Highway- the road to Nepal. 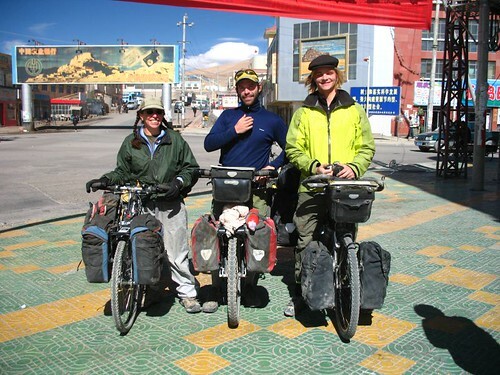 Our plan is to ride to Kathmandu, but before that, to visit Sigatze and Lhasa before back-tracking to Saga. I have found some warm additions to my sleeping bag, and so with these reinforcements, we hope that the cold won't deter us again. More than halfway to Ali and I really haven't written anything. I haven't had a voice. This part of the trip since leaving Kashgar- I'll have to tell you about that comedy of errors later (Four left turns brings you right back to start! )- has been very inward. Clearly, Xinjiang has not been about culture or people or scenery. It's about challenge. And acceptance. The places we have been riding for the past 800 kilometers have been high, cold, desolate. 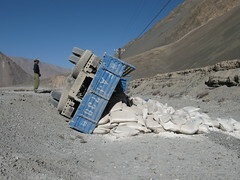 The roads, when we finally left the crazy-making, horn blowing, dust spewing, speeding trucks flying over the asphalt, have deteriorated into corrugated washboard littered with gravel and sand, sometimes deep. The passes, and there are a dozen on the way to Ali alone, have gradually increased in elevation. Tomorrow is our first one over 5000 meters, as we cross onto the Aksai Chin Plateau and meet some of our greatest altitude in western Tibet: 5440 meters. Today is our 22nd day of riding without a break. That's also how many days since my last shampoo. I've gotten good at bathing out of a one liter hot water bottle. Last night we actually slept inside in a warm dormitory in the last town before this next 188 kilometer stretch without a village. There were about 25 very friendly soldiers watching China Cable Television and feasting on delicious hot plates prepared for them by the efficient husband and wife proprietors. Maybe it was some sort of R+R- after dinner and CCTV, they left around 9 pm. Chris and I ordered five plates of food for the two of us- plus rice- a typical cyclist's dinner portion. And if our cookstove ever starts working again, we'll reheat the few leftovers for tonight's dinner. We are holed up at 4680 meters, in an abandoned road matintenance station, 24 kilometers below 5190 meter Khitai Pass. As there is no water for 31 kms past here, we plan to cross tomorrow and sleep at a spring at 4930. As you see, life these days has become very mathemeatical. We take care not to go too high in one day so we have time to adjust to the lower levels of oxygen in the air. There have been days when I think repeatedly: there is nothing else I'd rather be doing; there is no place I'd rather be; there is no one else I'd rather be with. It's an island here, Kashgar, for me. Coming back for the second time, we know our way around around, sort of. How and where to cross the streets. Where to get a godd lunch. How to get to the bank, the bike shop, the supermarket. How much a slice of melon costs. And the names of the key hotel staff. It has also been cooler than when we first arrived din August, so we've been able to enjoy our days and haven't had to suffer from hot, sleepless nights. But more than the familiarity, Kashgar is a respite from the vigilant state required when traveling in the Muslim world of Kyrgyzstan, Tajikistan, pakistan. Of course, the Uighur Autonomous Republic is also predominately peopled by Muslims, but here it is tempered by the Republic of China. Here I can comfortably walk around in a tank top, and could even wear shorts if I wanted to. We did meet one young shopkeeper who that the Taliban is good and Bush is bad. We agreed with him on the latter, but couldn't on the former. We looked elsewhere for yogurt next time. But the point is, it is a relaxing moment for us, poised between the world of the "stans and the forbidden lands ahead. With cyclists daily depating "east" as we are calling it, we can only believe that we will be successful as we aim for the 5000 meter high plateau. With enough to eat, proper clothin, sufficient knowledge, a comprehensive medical kit, cleaned and tuned cycles, rested and trained bodies, we are in a positive position for success. Of course, it is not guaranteed. Riders have died on this route- from stubborness or ignorance. Others have been hurt. We hope to be prudent and deliberate in our actions and decisions. We are willing to go only 20 kms in a day if the altitude warrants. We are also resolved to make our progress. We are experienced in cold environments. And we have the prayers of many of the faithful supporting us. Enshalla, we will arrive at our destination healthy and glad, if a little bit lean. Sage, thanks for the newest post. Really good to hear from you. Earlier we had extensive chatter with Chris before your blog was updated. I'm sure he'll share it with you. Glad that you guys have some company for the next segment. That should help all of your spirits. Great post, as usual very descriptive and full of emotion and details. Thanks for sharing it and looking forward for next addition.